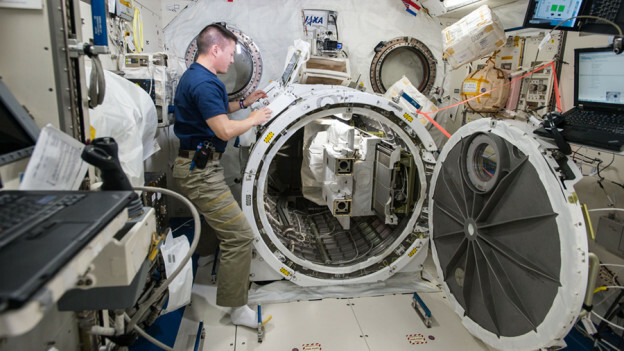 ISS045E033806 (09/25/2015) — NASA astronaut Kjell Lindgren loads a deployer device filled with 16 CubeSats into a small airlock in the Japanese Kibo Module on the International Space Station. Among the 16 satellites are 14 Dove satellites from Planet Labs that will be used for Earth observation, one for testing space based radios and another that will be used to track ships on the open ocean. The crew is working high-end maintenance today, while preparing for an upcoming spacewalk and an early December cargo mission. CubeSats are also being deployed this week from the Kibo laboratory module. Commander Scott Kelly checked on a power supply problem with the humanoid Robonaut. Flight Engineers Kjell Lindgren and Kimiya Yui installed cables in the Unity module where the Orbital ATK Cygnus commercial space freighter is scheduled to arrive in early December. Yui earlier charged spacesuit batteries that Kelly and Lindgren will use on a spacewalk planned for Oct. 28. Cosmonauts Mikhail Kornienko and Oleg Kononenko continued unloading cargo from the new Progress 61 resupply ship which arrived last Thursday. Sergey Volkov, on his third space station mission, worked throughout the Russian segment on maintenance tasks. The trio also had time set aside for ongoing Russian science investigations exploring magnetics and chemical reactions in Earth’s upper atmosphere. A small satellite deployer attached to Japan’s Kibo module will be busy this week as 16 CubeSats will be released into orbit through Wednesday. The Cubesats are exploring such things as navigation, communications and Earth observations.